Kurosawa’s long-awaited return to his psychological J-horror roots, since his latest films were mostly art-house ("Journey to the Shore", "Real") or social ones (Tokyo Sonata), finally occurred, and the result is quite similar to “Pulse” (Kairo). The story is based on Yutaka Maekawa's novel. The action in the film starts immediately, as a tragedy occurs when a serial killer detective Takakura was questioning, escapes. The result of the incident is for Takakura to resign, and to follow an academic career in criminal psychology. The script then moves in two axes. The first one takes place in the new neighborhood Takakura and his wife, Yasuko move in. 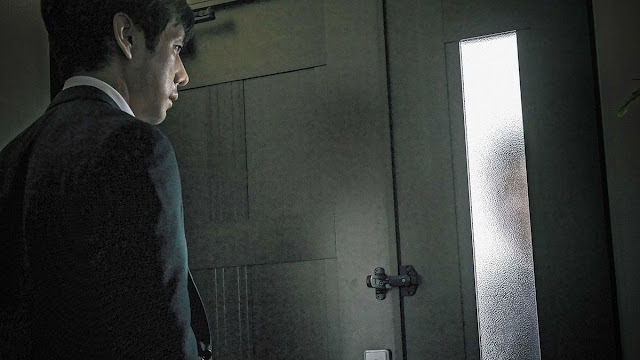 While Yasuko wants to become friends with the rest of the neighbors, they treat her with suspicion except for Nishino, who seems to be the most peculiar of all, until, at least, he is proven to be utterly creepy. The second axis occurs when Takakura decides to check an unsolved crime regarding a family that disappeared six year ago. As he meets Saki, the sole survivor, Takakura delves into the case, losing himself once more in it, while his wife seems to have psychological issues of her own. Kurosawa’s most distinct trait in his horror films is his ability to build up tension slowly until the point of “explosion.” This ability does not seem to have abandoned him, as he succeeds in gradually producing the horrific elements, through the slow pace and the not so frequent dialogue, while retaining, at most of the time, a general sense that something is wrong. However, the issue with the aforementioned build-up is that it lags a bit, a fact that results in the agony deteriorating after a time, although the moment of disclosure and the extraordinary finale compensate, to a portion at least. It would be for the best, though, if the film was 15-20 minutes briefer (it actually lasts 130 minutes). All three protagonists emit the sense that something is wrong, from the beginning of the film. Hidetoshi Nishijima as Takakura seems too eager to examine the crime, Yuko Takeuchi as Yasuko seems too eager to make friends, and most of all, Teruyuki Kagawa as Nishino, who, looks utterly creepy, no matter how he acts. In my opinion, Kagawa could not be missing from a film called “Creepy,” since he excels in portraying similar characters. All the aforementioned give fitting performances, in harmony with the film’s general aesthetics, but Kagawa is the one who definitely stands apart, with Kurosawa actually anchoring the film on him. Technically the film follows the ambient atmosphere Kurosawa implemented in his horror films, with the slow pace, the subtle sound and music, the realistic depiction of exteriors and the onerousness of interiors. In that last aspect, Akisizo Ashizawa does a wonderful job in the cinematography department, particularly in the interior of Nishino’s house. The master of slow terror has returned, but he is a bit slower than he should be. Nevertheless, the film is definitely worth seeing for its cast, the shock of the disclosure and its unexpected finale.